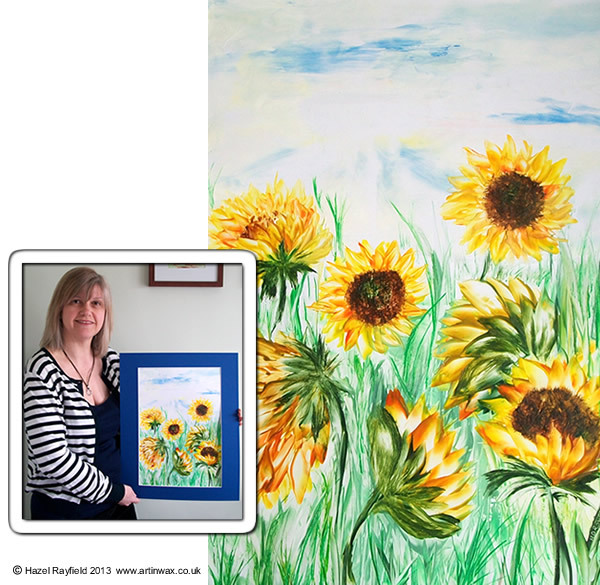 I have just finished this piece featuring a valley of sunflowers. I worked in hot wax on a A3 gloss card painting using my hot iron and stylus tools together with a heat gun for remelting the wax once applied. I have been painting a lot of Sunflowers of late, and this piece took about 10 hours in several sessions for me to get to where I wanted to be. I used to find I liked to finish a painting in one or two sessions but I have changed the way I work now and often feel coming back to a piece after a few hours or days break I can see how to develop the picture, and as encaustic wax is so versatile I can easily remelt and rework the piece until I am happy with the work. It can be a challenge photographing artwork to show online. I find that with my wax art it can be difficult to show the subtlety of the work as when displayed on a computer screen lines in the wax which add a great texture in real life can look clumsy when photographed. Likewise the colours and the sheen, although they do show, often have much more depth than represented in online screen view. 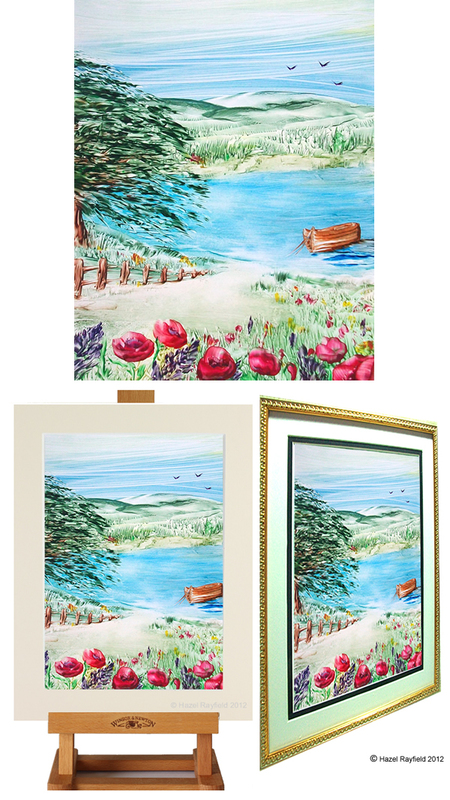 It is also, at times, difficult to know how to present the paintings, I sometimes use a display easel to demonstrate how a painting could be displayed or a frame, which can help show how a piece maybe used. But this doesn’t always give the true feeling of size. When we photographed the “Splash of colour – flower meadow” paintings this week I decided to hold the pictures to give a perspective to the size. I had a fellow artist comment on how effective this was and so again with this painting I am showing it in relationship to its surroundings and me holding it. This picture is approx. 16 x 11 in size and the mount in a mid to dark blue really highlights the golden yellows of the Sunflower subject I feel. Why not leave me a blog comment below.